Trick or Treat - Goose Creek - Candle Find ... the site for candle lovers! Trick or Treat from Goose Creek was probably one of the last Halloween candles I was thinking about purchasing this year – until I read the scent description. Grab your candy bag! Creepy critters fill the streets. Graham crackers! Spiced Pumpkin! Apple Cider! Milk chocolate! Vanilla! Oh, yes please!! As a bakery lover, I couldn’t help wondering what all that would smell like blended together. My mouth was watering just thinking about it. Smelling the wax, I smelled apple cider, pear and vanilla the most but hoping all those other yummy notes will come to life once the candle was burning. Let’s find out!! I lit this candle in my master bedroom to start out and waited for the Trick or Treat magic to begin. 20 minutes in and my entire bedroom smelled like sweet apples and vanilla blended with pears and you could clearly smell the pear loud and clear. I liked that and thought it blended well with the apple notes. The spiced pumpkin never did materialize for me but the chocolate and graham cracker I could smell when I was up close to the candle. Once you moved away though, the apple, pear and vanilla definitely dominated overall. The aroma reminded me of a toned-down apple cider and pears blended with a creamy vanilla base. In spite of the missing elements I couldn’t detect, it still smelled really good and I enjoyed the heck out of it. Strength – I would rate this candle a 7 out of 10 in a really large room. 10 in a medium to smaller rooms. Not bad all in all. How did my Trick or Treat candle burn? This candle burned great. No wick issues. Clean burning from beginning to end. The first half of the candle, wick trimming was required before each lighting but after that, it burned like a dream. No maintenance after that. 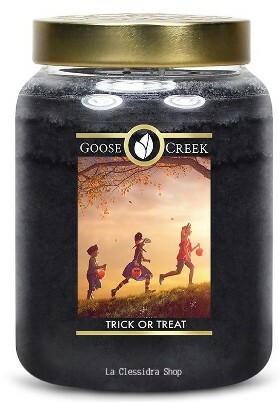 I enjoyed Trick or Treat from Goose Creek and found it to be a stellar scent for Halloween. This wasn’t your average apple scent. It wasn’t spicy or super bakery… it was somewhere in between the two. 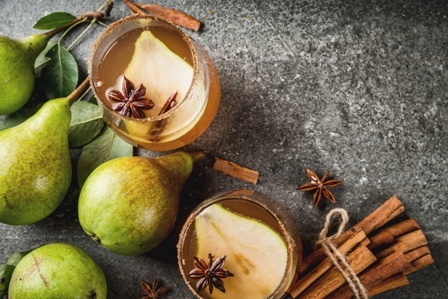 Just imagine an apple cider and vanilla with sweet pears, a hint of graham crackers and a little teeny dollop of chocolate. YUM!! I could totally go for this scent on any Halloween night. Happy candle hunting – and Halloween! I love Goose Creek! How was this one visually as it burned? I’m never sure how I feel about the super-dark colors like this one, but if it smells great, I’m totally open to it! Thanks for another great review. Visually, not as striking as lighter colors. The color of trick or treat was a dark brown but it flickered beautifully as always.